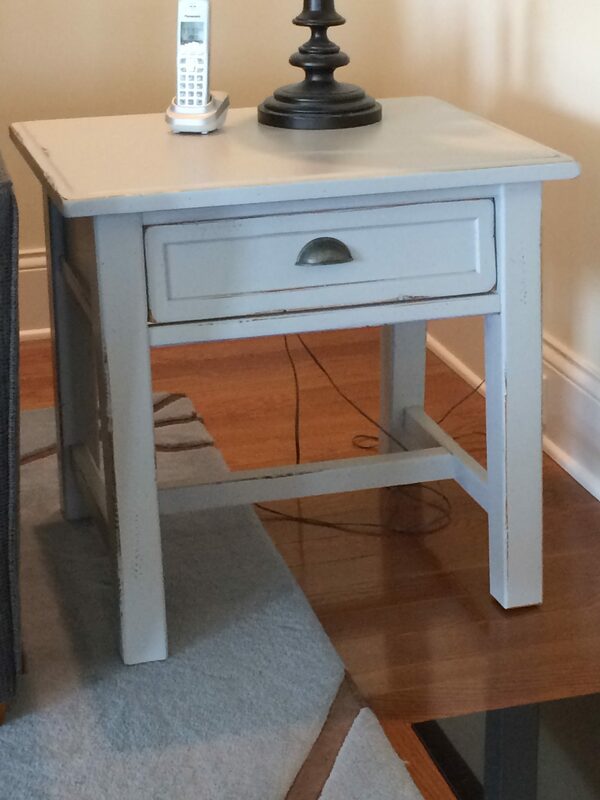 This end table was already adorable. 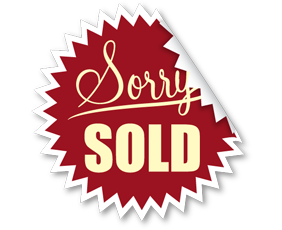 But my customer just wanted to make it blend with her other furnishings a bit better. The stain color was making it stand out like a sore thumb. So all it needed was a bit of gray paint. She chose a warm light gray. 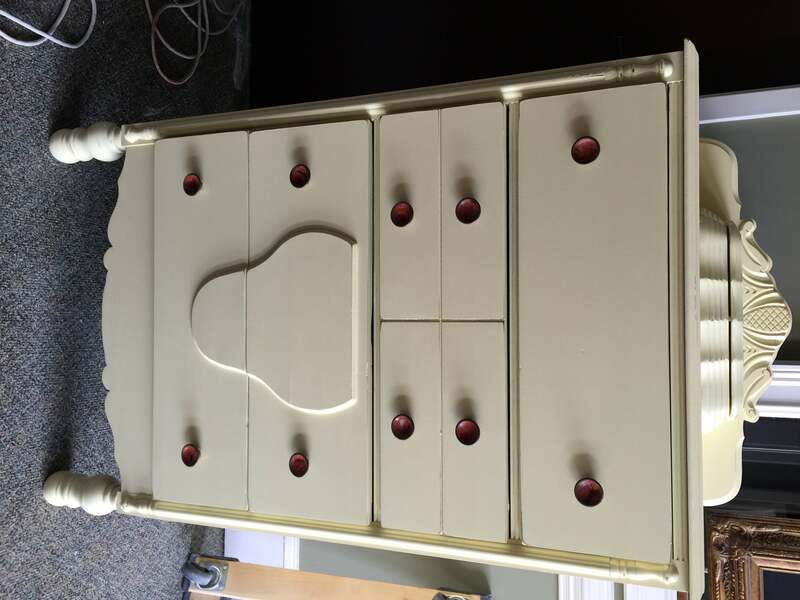 The piece already had some great distressing and dents so we just highlighted those, to keep that farmhouse chic style! This traditional looking cherry nightstand had served it’s purpose but my customer now needed it to look a little more modern. 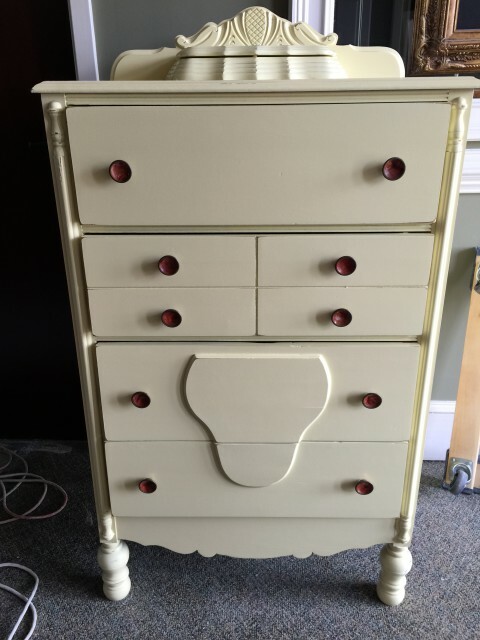 No more dark, reddish stain. I updated it with a cream, soft white. 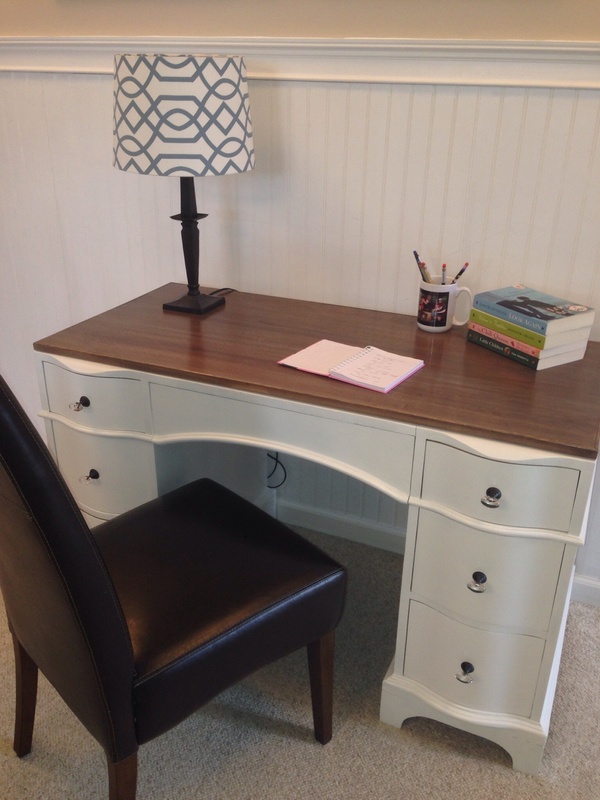 My customer was in the process of moving into her new forever home, and it was time for some changes. 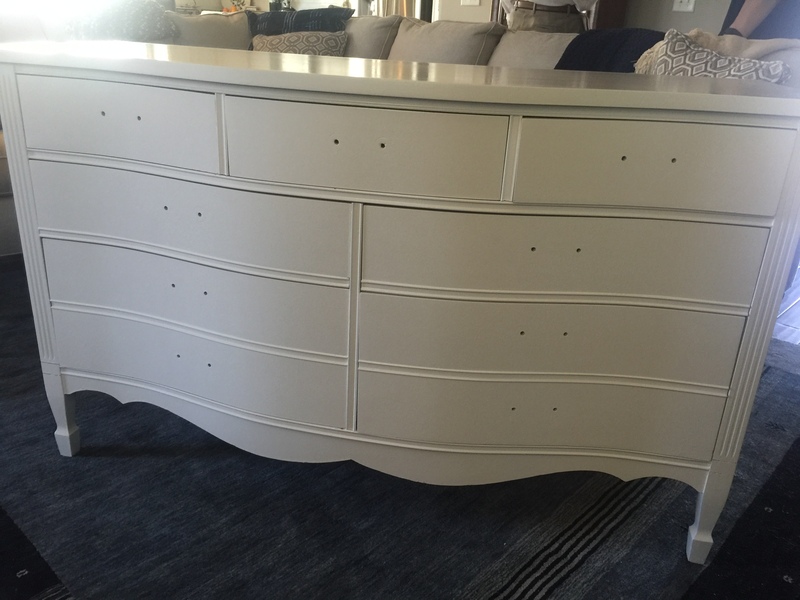 Freshening and lightening things up were the first priority for this dresser. 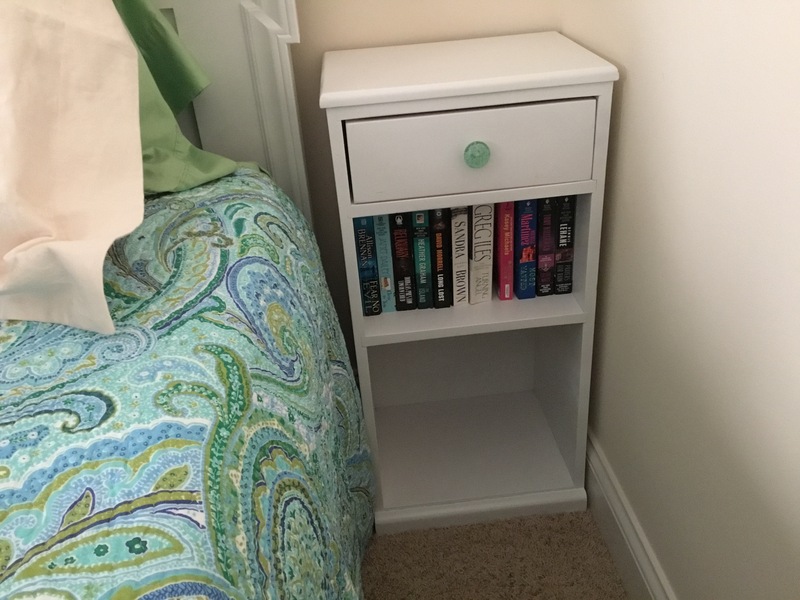 This little nightstand is perfect for rooms that are short on space, like a child’s room or guest bedroom. It would even be perfect as a little extra storage in a bathroom! 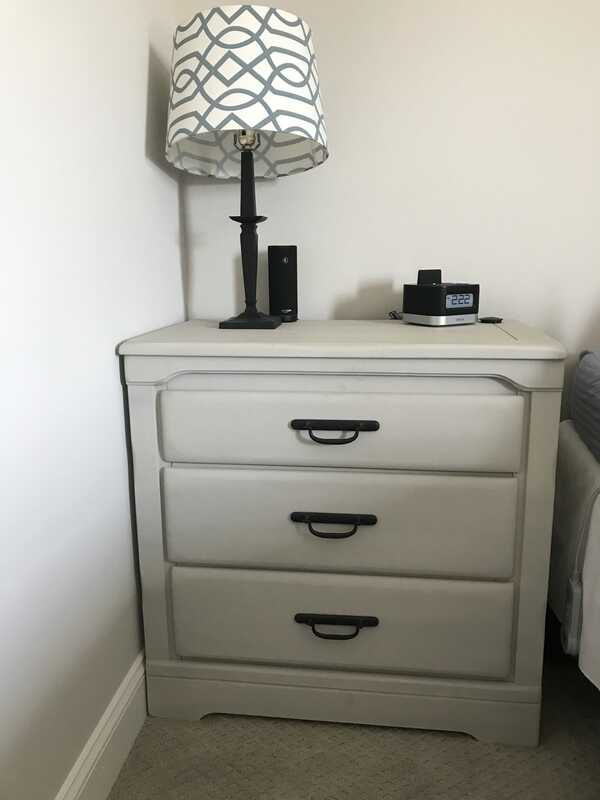 My customer needed it to fit in a very tight space in a guest bedroom but the original/dated finish just wasn’t working any more. 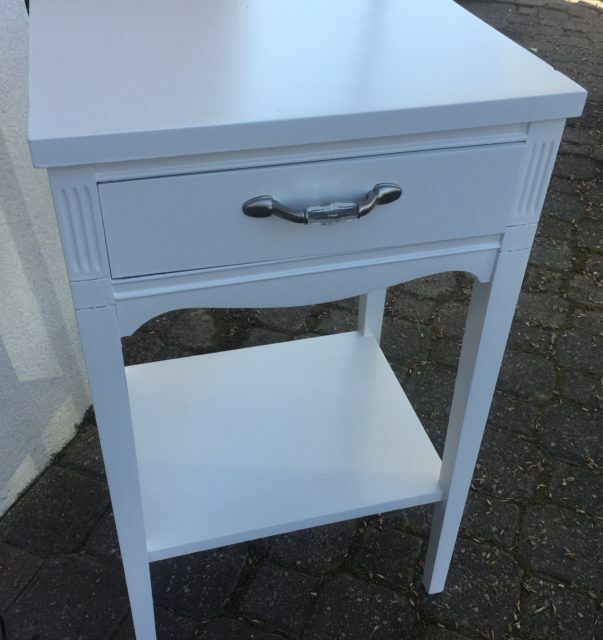 There was nothing structurally wrong with this cute little nightstand from Harrison Furniture. It was just the dated finish that needed to be updated. 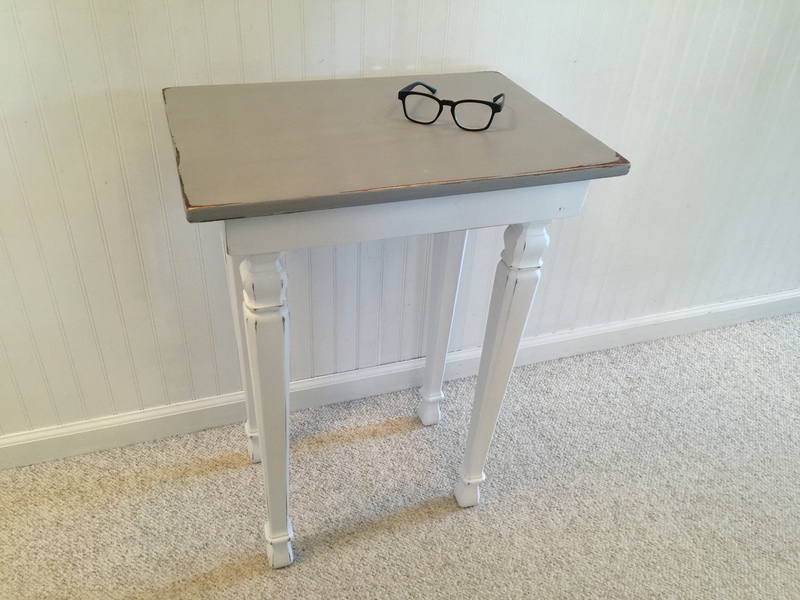 I did that with a warm soft taupe chalk paint. One of my customer’s was able to get her hands on this amazing, solid oak, vintage dresser and she knew a good thing when she saw it. 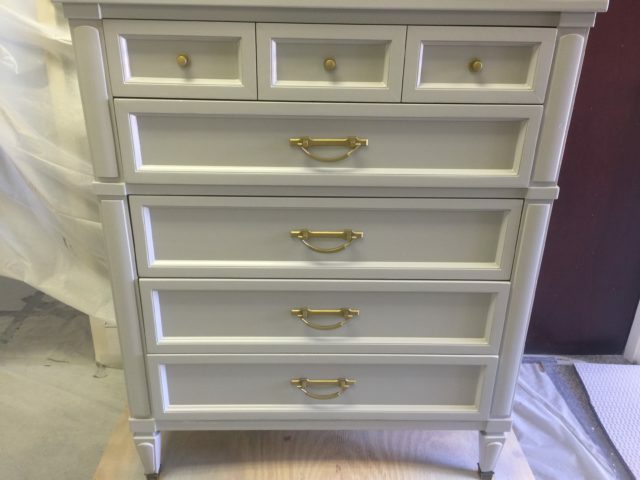 All it needed was a fresh color and some new knobs! 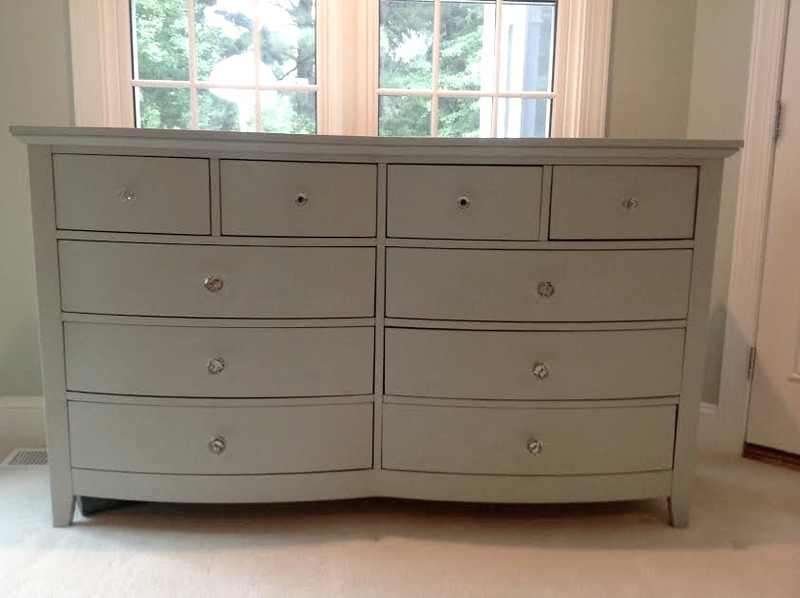 She settled on this beautiful grayish green color from Sherwin Williams called Oyster Bay. 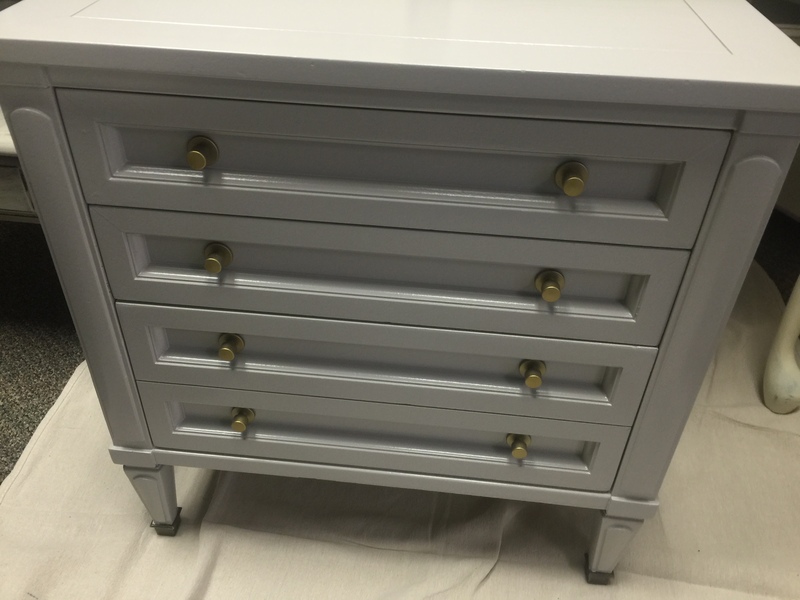 After adding some new crystal knobs, the piece was a knockout! 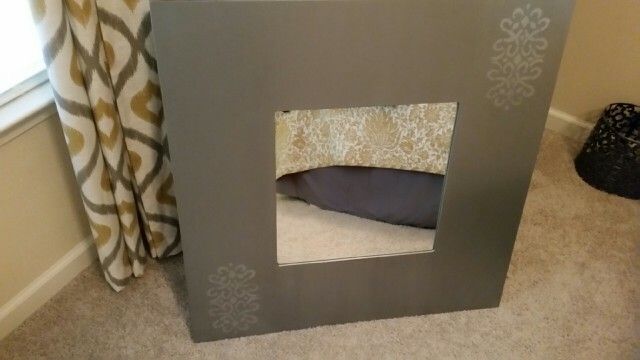 My customer had a gorgeous wall mirror with a metallic finish that had sustained some damage during a recent move. Since it wasn’t repairable we decided to go for something entirely different. I’ll be honest, this very rustic nightstand had some issues with it when I found it. 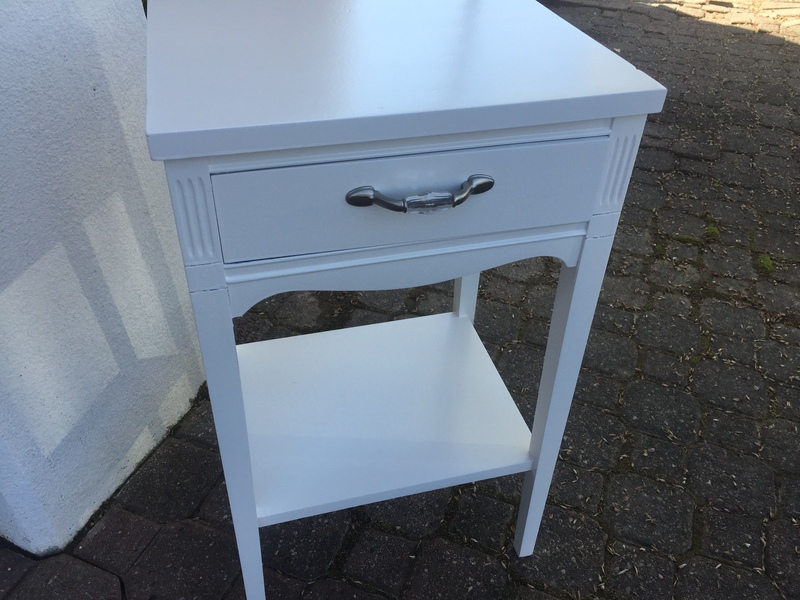 The chalk paint finish on the legs felt, well…..chalky. The sides were starting to split a bit. And the top had some nail pops. In my world, none of those things are necessarily horrible. But there was definitely room for improvement!